The Ideal Household Budget for Spending | Save. Spend. Splurge. But that’s kind of useless if you don’t know what these vague categories contain. Does “Life” mean things for your pet as well as your own groceries? The answer to both questions above: Yes. The trickiest category is Housing for me because it can be hard to think about what goes into it, whereas the category of Life is the fattest one. …all the way until you are debt free! WHY DOESN’T THE TELEVISION, INTERNET, OR THE TELEPHONE GO UNDER “HOUSING”? Because you don’t need either to have shelter. Plenty of people live without any of those things. I only have a cellphone, and even that plan is shared with BF, so we treat it like our portable home phone. Housing is a roof over your head. What does it take to run a place like that? Insurance, Utilities and the Rent or Mortgage payment. Therefore, stuff you pay for that you use to entertain yourself or communicate with others as part of your Lifestyle goes under Life. WHAT DOES YOUR GENERAL BUDGET LOOK LIKE? As we all live in different parts of the world, in different areas of the country, and have different incomes, this will definitely NOT be personalized to you. For instance, you may have a pet, whereas I don’t, and you need to budget for that. Or you live in the U.S. and you need to budget for healthcare, whereas I don’t in Canada. Here’s what a typical budget would be if I made one for myself for a month, living in a hotel with a car. I don’t have a car right now, but I would get one secondhand in cash if I had to use it for work and I couldn’t take the bus. Since my income is so irregular, I gave myself a generous ~$40,000 gross income a year as a budget because I assume I can always get a job that pays at least that per year if times get rough. Basically, the less I spend, the less money I need to earn per year (gross). Since I can always spend less than ~$40,000, but that’s the right gross income to maintain my current lifestyle. As I’ve really only been working full-time 2 out of the 5 years or less than 50% of the time, if I am being honest. So my income to date has been on average $70,000 gross per year as a freelancer for 5 years. That is about $54,700 net per year as an income in Ontario. As I’ve amassed around $200,000 in my net worth to date, I’ve saved $40,000 net a year. Actually, it’s $60,000 more than that because that’s how much my debt cost when I started working, and cleared it in 18 months with my budgeting tool, but I digress. All this really means I’ve been spending a lot less than $40,000 gross a year, even with all my traveling, and dipping into savings when I want to buy things, and that’s partly due to being a consultant and having your life subsidized because you’re always traveling. Therefore ~$40K is my maximum budget because I account for if I have a car, pay for gas, insurance, license plate renewals and so on, which I haven’t had to in about 2 years. I also always max out every retirement fund you can think of which helps my taxable income, and save a lot of money because I share the costs 50/50 with BF. DEBT = I don’t owe anyone, anything, which helps a lot. SAVINGS = All the rest of my money. See above about saving everything else. You will notice that I spend a lot of money on Food, Clothes & Electronics for instance, but barely anything on Cellphone, nor on anything like Furniture or Household stuff. This is in line with my minimalist philosophy to spend on what you care about, but not on things you don’t. I have less things in terms of quantity, but each item costs more money because of I am willing to shell out for quality because it lasts longer. There you have it, my general household budget that I’ve been entering in my budgeting and expense tracking tool. I also plan on lowering this spending for 2013. My new Ideal Household 2013 budget is coming up next week. Where you start to get a problem, is where you realize that your debt repayment minimums may be bigger than 15% a month, maybe even double. You can’t put more money on your debt if you don’t have it to spare. There is also no other choice, and no other way. If #2 is not an option and you can’t cut back, make more money. WHAT DO I DO IF I DON’T HAVE ANY DEBT? People say that the 15% of the Debt Repayment should be absorbed into other areas of your spending so you can have a nice life, but I am a big proponent of sticking it all (or at least the bulk of it) into savings, and saving a hefty 25% of your net income per month if you can. If you’ve already lived without that 15%, what’s it to you? I’ve always felt that 10% of your net income is far too low of a number to be saving in general for short-term funds, retirement and anything in between. I like 15% – 20% instead as a rule of thumb, although my personal rule of thumb is: as much as is reasonably possible. What’s your household budget? Do you use the same categories? So living in Los Angeles, my housing costs are about 50% of my net income. However, where I am allows me incredible quality of life and I can take the bus to work, and walk most places on the weekends. Where would property taxes and annual car costs come in – part of ‘home’ and ‘car’ budgeted monthly? You’re so lucky! I wish I could walk to work 🙁 I can bus to work but it takes a while and I’d rather not deal with that and a child. Yes to property taxes. Take the total yearly amount, divide it by 12 and put it in a reserve each month in your budget (transfer the amount out of your chequing account into savings or something), and when it comes time to pay the full bill quarterly or bi-annually, then take the money out of the savings. I always do this for taxes. Do you both make the same income? 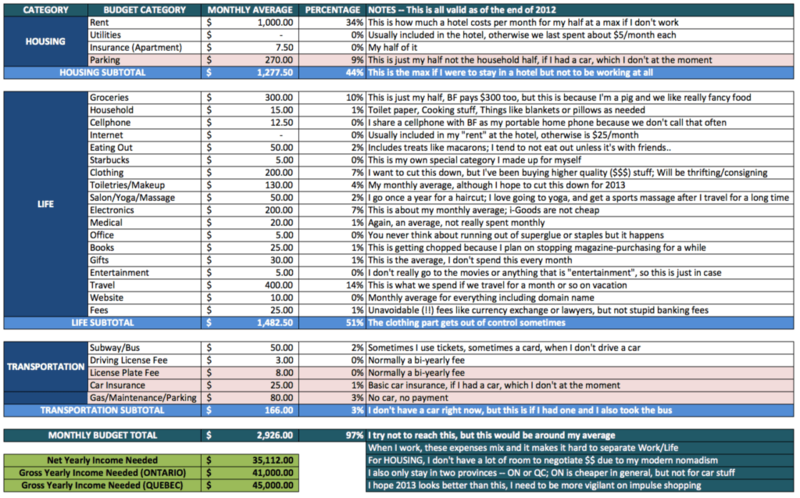 My GF and I do a % of our total income to determine what % we share for expenses. For example if I make $75k and she makes $25k I pick up 75% of our shared expenses and she picks of 25%. With a 50/50 split you could run into a situation where the other person could run into a hardship to keep up with shared expenses. Yes we both make the same $ when we work, and even though I haven’t worked since I left my last contract I have enough saved to continue paying my half, as would he. If I ran out of money I would just get a job. For now, I don’t need to. Your way sounds very fair and equitable as well but consider what would happen if you couldn’t work .. Could you live off her income? Good point Kevin. I’d put it under Life just as a general catch-all. I tend to not include any charity or tithing in my own personal budgets because I consider it outside of my actual expenses, taken out of my net worth directly (I do that once a year, at the end of December). $200/mo for electronics? $15/mo for household hardgoods? Yes, I am punking you. Hmmmm… trying not to feel hopeless here. My debt is 41% of my budget, thanks mostly to student loan debt, and borrowing from my 401K for my house (I know now it’s a terrible idea, but didn’t know then). I’m going to have to seriously start looking at bigger changes. I really enjoy your blog and your own story is very encouraging. What about including into the household budget expenses for education? I have not seen that on any budget planning. That’s because Education is not a staple in a budget. Not everyone is a student and/or paying for Education for their kids for example. Education would fall under the section for Life. We are renting out our old home. So we are paying two mortgages and we usually receive rent. Would the mortgage payment on the rental house go under housing or into another category? and would the rental payment we receive go into income? Rental payment goes into “Income”. Mortgage payments for your principal residence go under Housing because you’re living there. Mortgage payments for your investment (old home) goes under “Debt” (it is a debt). You can show this in your Net Worth by noting the current market value of your old home (investment), minus the mortgage outstanding. I don’t see the words “child care” and “health insurance” anywhere in this post. I guess I should move to Canada. And give away my baby. On a serious note, I would like to know how you’d afford those two, which for me, are coming in at about 35% right now. It’s supposed to be under “Life”, which includes Groceries (the baby eats), and Household items (Diapers could be under there). Housing is a touch over (interesting, I was sure I’d be WAY over). Bills isn’t a category so umm, yeah I don’t know 😮 But I have no consumer debt (only the mortgage) and I save at least 24%, so right what you’d suggest. And transport? Well that comes out of ‘day to day’ as I don’t run a car (work pays :D), and my occasional trains and taxis are negligible. Thanks for the comparison, it’s pretty helpful! @SarahN @ Livetolist: You’re welcome! Glad it helped. I know it helped me when I looked at what I spent. I actually spend way under in some areas (transportation) but WAY over in others (clothes). Living in the Yukon, our utility bills and transportation costs are enormous compared to what most Canadians probably expect to pay. Kind of throws this formula for a loop. Luckily we have no debt, no mortgage. But I’m thinking of building underground or something to cut down on these energy costs! Four wheel drive trucks use a lot of gas too. Oh well. Good to get us thinking about these things instead of just flushing all that money down the toilet every month and not thinking about it. Thanks! So how much would you pay for what you consider basics here? I guess I need to figure out how to get more money because my net is $34,000 and I owe $20,800 on a HELOC. That is my only debt. I plan to pay off $6,000 of that debt this year. My basic expenses take up most of my money and I work very hard but after looking at your numbers I see I am doing much worse than I thought. This is my first visit here but I will be back. Found you on Boomer and Echo. You do need to make more money, by picking up another job. Alternatively if you can cut back on your expenses like sharing an apartment rather than being on your own, and putting THAT towards your debt, it would help as well. Just don’t go too far with budget slashing because you still need to be living on that budget for probably the next 3-5 years depending on your rate of debt repayment. Although if you can pay $6K towards your debt net each year, you will be done in under 4 years. That isn’t so bad. I find any debt over 5 years (max) unless it is a mortgage is very painful to contine paying for. 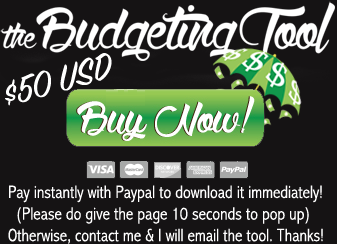 I use my budgeting tool ( http://www.thebudgetingtool.com/why-buy/ ) to log each receipt manually and put it under the appropriate business category so that at the end of the year, I just run my Excel filters or do a quick SUM and I have the exact figure. I stay away from Mint.com and other online budgeting sites because it bothers me slightly that it’s free, which means they have to make their money somewhere —- selling your general info (lumped into groups with others) based on demographics, or looking at how you spend, and selling that info to retailers you frequent. Amazed at the assumption that debt repayment is part of a standard budget!! Well that’s just a general rule IF you have debt to repay like a mortgage 🙂 Shouldn’t be more than 15% of your budget so you can comfortably afford to pay it. Interesting process. Our housing expenses and our savings each take up 27% of our budget. From there it’s Taxes (13.5%) and Daily Living (11%). My budget tracks over 100 items under 14 categories. It’s become more complex as we’ve got older and had kids (and our oldest started preschool and other activities), plus I’ve started a business. I like that you put phone/cable/internet under Life instead of under Housing. I think I’ll make that change, too. My savings is in addition to this, so it is really about 66K I need to make net a year or 90K gross. 30K to living, 36K to savings would be the goal. I also think once I have kids, they will have categories too (RESP) and so on. My budget will be insane! I’ll need to cut down somewhere. For now, I am tracking all my personal and business categories for the first time in a hybrid budget. Using myself as a guinea pig to see if it works better than 2 separate ones like I did last year. I also have a third budget that is just between BF and I. It is just a repeat, concise list of only everything we share as expenses, kind of like a running tab of how much he owes me at the end of each month. I track and pay for everything between us during the month because his categories are simple and mine are not. It’s easier for me to do it that way.